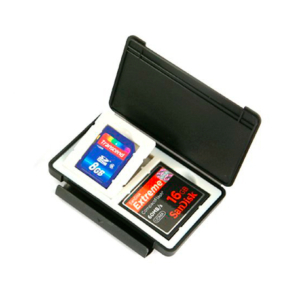 Keep your media cards safe and to-hand with this compact and secure memory card case. Holds two cards (SD or CF). 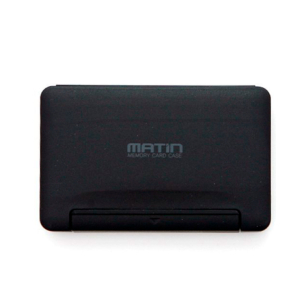 This ultra-slim black memory card storage case from Matin is an ideal compact solution if you want to carry one or two extra media cards with you on a shoot. It's a tough little case, made from tough polypropylene on the outside and with a rubberised interior. The secure latch clips in place to keep the contents inside secure. You can store two media cards at any one time – Compact Flash (CF) or Secure Digital (SD) or one of each. It will also fit SD mini or Micro SD cards when used with an appropriate adapter. It's slim enough to fit into a trouser or jacket pocket or to tuck anywhere in your camera bag, measuring only W93mm x L60mm x D13mm (3.6”x 2.5”x 0.5”) approx. And there's no significant weight gain as it only weighs 45g when empty. #OFFER# Save – buy two for only £5.95. Card safe was exactly what I wanted and discount for 2 made it even better.